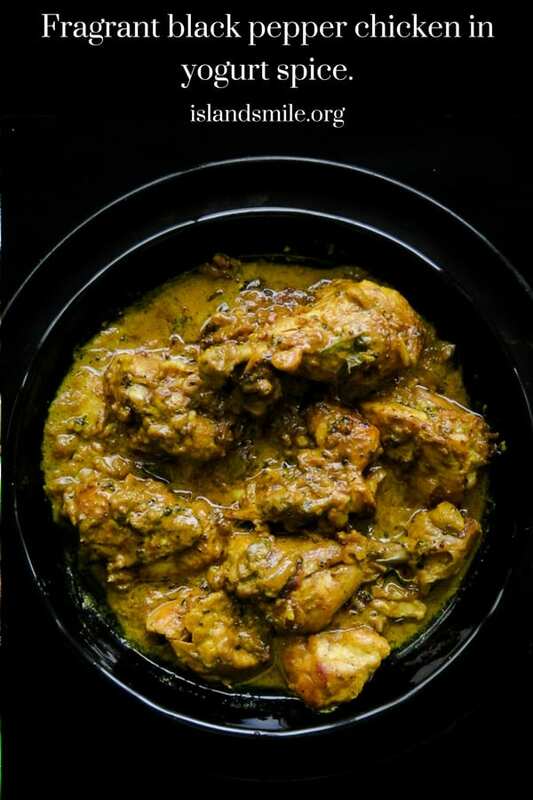 A fragrant chicken curry with a deep satisfying gravy so thick, a second serve is a must. O.k, I admit, I get a crazy craving for a chicken curry once a week. I love cooking them, I love infusing flavours to them and if you’ve browsed around the recipes on the blog, you might notice I have a few dishes with chicken as the main ingredient. It’s easy to get tired of making the same chicken dish weekly. Since I seem to be doing a lot of cooking anyway both for the family and extra dishes for the blog, I’ve got this insane idea to cook, experiment and add every kind of chicken recipe from around the world as much as I can. What do you think? possible? not possible? 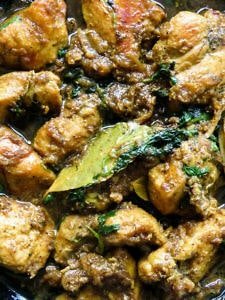 recipes to try- cardamom infused ginger garlic chicken. You’ll notice, I’ve already started posting a chicken-themed recipe once a week, not only is it a good way for me to introduce global dishes to my family and give variations but I really hope this would help you to ease your way into trying some of these dishes as well. 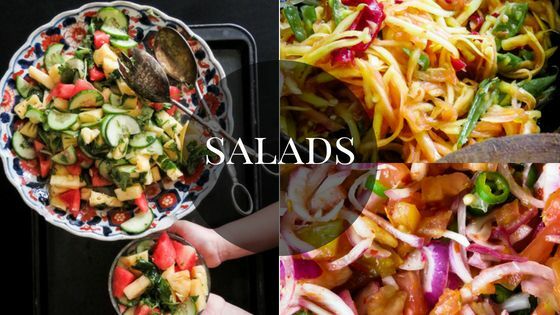 You are already cooking it, once or twice a week, why not give it a new spin? 1/ finding some of the spices and key ingredients, I’m seriously limited by this, hopefully, this would lead to new recipes or I might just have to order online. 2/Photographing the final dish, I try to capture the texture, to give you an idea of how it would taste or tempt you to try the dish but sometimes two dishes with different taste will look the same and trying to capture that small difference into a photograph can be really hard, especially when I’m trying to keep the dish as the main focus. Anyways, enough of my issues, I hope you find my chicken themed series interesting and at least try to make some of them, my kids are actually loving the variety. So if you are having a hard time deciding on how to cook those chicken parts in your refrigerator, then make sure to stop by and find out what I’ve done for that week. Until I find a way of indexing all the chicken dishes in a way that’s easy for you to find what you are looking for, please use the search box and explore some of the chicken dishes I’ve made so far. 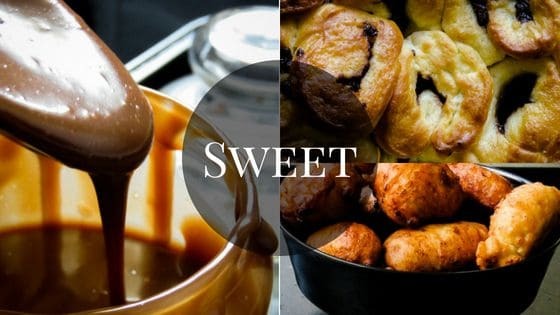 If you have any issues with any of the recipes, you can always reach me through the blog comment section or through any of the social media mentioned below. 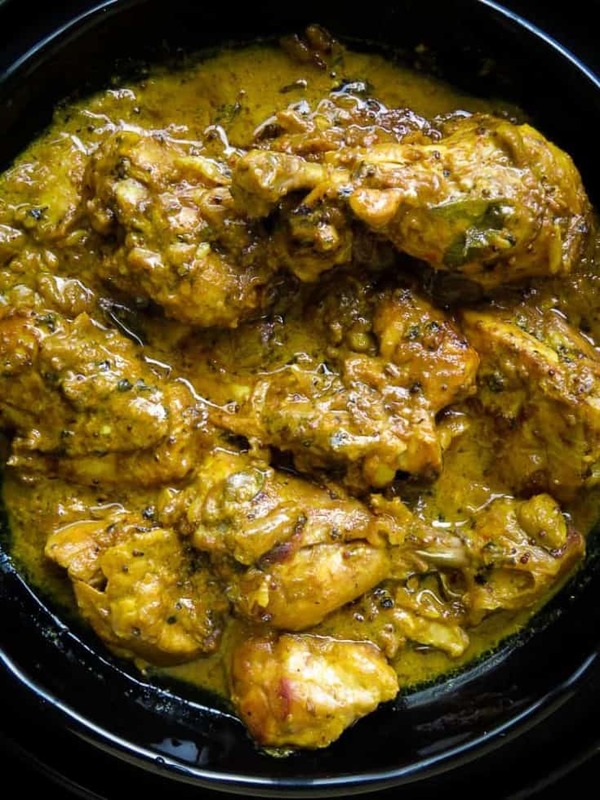 recipes to try- oven baked one pot lemon grass chicken curry. Try to cut it into 10-12 pieces. and increase the ingredients as mentioned below while keeping all the other ingredient quantity the same. The amount of coconut milk depends on how much thick gravy you need, use 1/2 for less or 1 cup or little less than that for more gravy. *This is such a great recipe. I’m Lovin’ It! *Absolutely loved the black pepper n yogurt chicken curry… Tried it out yesterday. The family loved it. Creamy n intelligently spiced. Thank you. You will need a large pan that can hold the chicken parts as well have space to constantly stir. 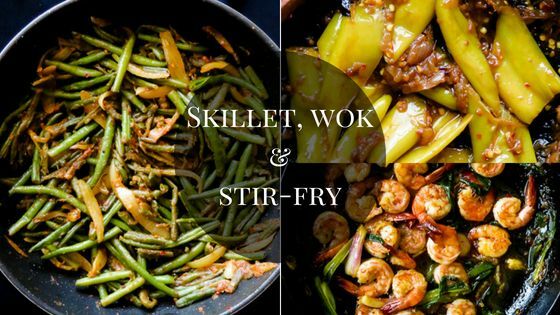 I like using a wok to make most of my curries and one-pot meals for the family. I believe this is one kitchen item every kitchen should have. an hour or two before you begin cooking, start with the marinade. have all the ingredients ready, this would help you save time. Choose a pan that can hold all the chicken parts without crowding. this bowl should also be able to fit into the refrigerator. Into this bowl, add Yoghurt, crushed peppercorns, salt, turmeric powder, 1 teaspoon of garlic and ginger, 3 cardamoms. mix all the ingredients with a spoon. Season with Salt as needed but use it sparingly as you will be adding Tamarind, later in the cooking process. Place chicken parts in the marinade, rub it over the chicken thoroughly, cover with cling film and refrigerate for 1-2 hours, you can also keep it overnight. Once the chicken parts have marinated for 1-2 hours, leave it out for 20 minutes or until they reach room temperature. While the chicken reaches room temperature, place a large pan over medium heat, pour in oil and leave it to heat for a minute or 2. Once the oil heats, add curry leaves, Onions, ginger-garlic, green chillies, cinnamon, the leftover cardamom pods and sauté for 2-3 minutes until all the ingredients turn soft. 5-7 minutes. Add the mustard seed cook until they splutter and immediately add the chicken parts WITHOUT the marinade and let the chicken sear until they turn light brown on both sides. leave the chicken until they slightly brown over medium heat, 10-15 minutes. While the chicken browns, pour tamarind juice over the remaining marinade in the bowl and mix. Once the chicken parts are slightly brown, pour in the tamarind with the remaining marinade, stir constantly and let the gravy reduce by half. This should take 15-20 minutes over medium heat. check for seasoning. As the chicken absorbs the tamarind and marinade, pour in the coconut milk and cook over medium heat until gravy is very thick. 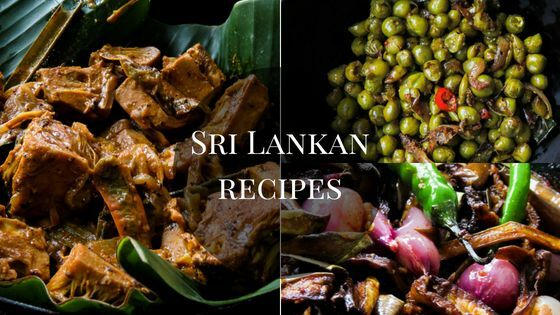 Serve with warm rice or your favorite type of roti. BLACK PEPPER CHICKEN MARINATED IN YOGURT-SPICE. 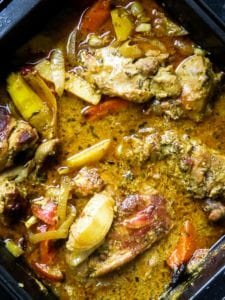 A FRAGRANT CHICKEN CURRY DISH WITH A DEEPLY SATISFYING GRAVY SO THICK, A SECOND SERVE IS A MUST. Hi, this looks very yummy! I am wondering, if I wanted to use vegetables instead of chicken, would the process be the same do you think? Hi Monique, the base of this curry is thick which goes well with chicken but I’m not sure it’ll be the same for vegetables. I think the gravy will completely smother the vegetables and their taste. Is there a reason you want to substitute chicken with vegetables? (Vegetarian or vegan). If so let me think if I can come up with something of a similar version for Vegetables. could you tell me how much of everything would i have to increase for a party of twenty people . I would really like to try out your recipe . Can you tell me how many adults and kids in the party of 20? Glad the family and you loved the recipe. Thank you for your time and feedback. appreciate it. Is the tamarind paste essential? Hi, I would highly recommend using tamarind but if you are asking me a substitute, i would cautiously say to use lime juice. Although, I’m not sure how the the lime would affect the overall taste of the curry. 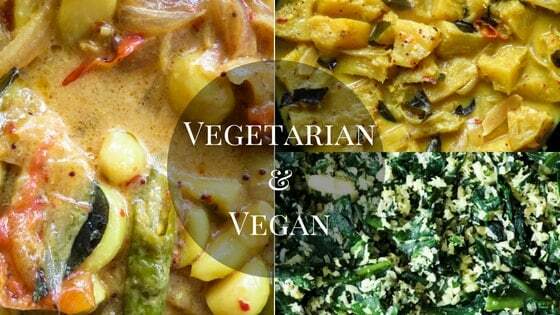 At which stage do you use the curry leaves? Am I missing something cos I can’t see it. The curry leaves are added with the onions, no you didn’t miss anything, totally on me, I have edited the recipe to include curry leaves. thank you. Hi! If I wanted to make this with mixed veggies instead of meat, what do you think would be the best way to do that? I’m not certain if the recipe will turn out well if you replace chicken with a mix of vegetable. what veggies do you have in mind? I think you can try making this recipe with mushrooms? I would suggest button mushrooms or any other hardy mushroom. you can also try tofu or cottage cheese.